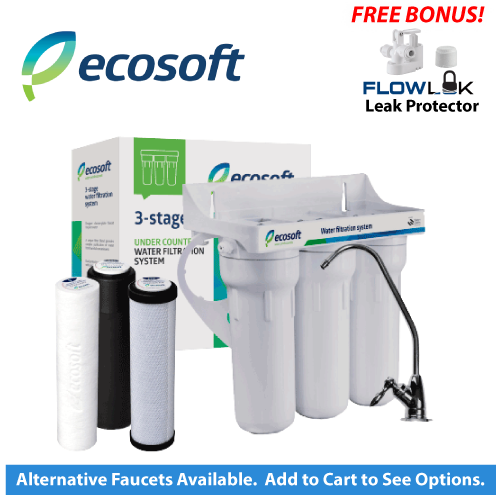 The Ecosoft 3-stage under sink water filter offers multi-stage filtration in a compact, sleek under-sink design. It is an excellent choice for use in homes, offices, cottages, recreational properties, and RVs! This under sink water filter provides premium quality drinking water with less hassle and cost than bottled water - only pennies per day! Removes sediment, dirt, rust, and other physical particulate down to a level of 5 microns. Removes hardness, heavy metals, chlorine, and a wide range of contaminants that impact taste and odor of water. This coconut shell activated carbon block filter further enhances removal of chlorine, disinfection by-products, and a wide range of organic impurities. This system is designed for use on all chlorinated and non-chlorinated potable water supplies. It is an excellent choice for most homes. If you do not receive your water from a municipal water system (you get your water from a well, lake or other non-treated source), you should have your water tested to ensure it is biologically safe (free of bacteria, viruses, and other harmful microorganisms) before using this filter as your only water treatment. If your water is biologically contaminated, you should consider a whole-house ultraviolet purifier in addition to this filter unit to kill any remaining microorganisms. The filtration unit mounts under your sink, out of sight. Water supply is gained by attaching a simple assembly to your cold water supply pipe (copper or plastic). You will have to drill a hole in your countertop or sink frame to attach the attractive chrome-finished long-reach faucet. It is a relatively easy do-it-yourself project, or if you prefer, you can have it installed by a handyman or plumber. 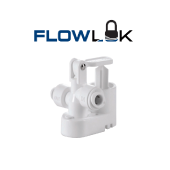 The unit includes all installation hardware and a complete installation guide. 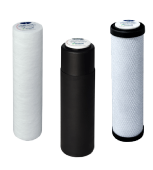 Ecosoft filter systems are covered by a 1-year limited parts replacement warranty against manufacturing and workmanship defects, including the housings, faucet, fittings, and O-rings (excluding filters), subject to the feed water conditions noted above. For health reasons, we do not accept returns of water filters/systems after they have been installed. If you are in doubt as to which filter is best for your needs, please feel free to call us toll free at 1-866-376-2690.